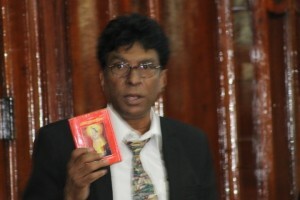 Dr. Clive Jagan as he took the Oath as a parliamentarian last year. Opposition People’s Progressive Party Civic (PPPC) legislator, Dr. Clive Jagan is ill and is overseas, according to Opposition Leader Bharrat Jagdeo. “Dr. Jagan is abroad. He is seeking medical attention,” Jagdeo told a news conference. Jagdeo did not want to say whether his party would seek a replacement for Jagan, a nephew of late PPP co-founder, Dr. Cheddi Jagan. Records show that of the 23 sittings so far after the May 11, 2015 general elections, Jagan has been absent from six sittings, two of which- 18th and 19th– he did not give notice to the National Assembly. However, from sittings 20 to 23 he has been granted leave to be away. Sources indicate that Jagan should return to Guyana by next month. Dr. Jagan and his family own the Jagan Dental Centre at the corner of Lamaha and Light Streets, Alberttown.